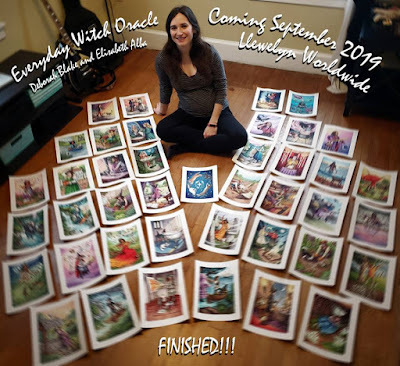 As many of you know, illustrator Elisabeth Alba and I have been working on The Everyday Witch Oracle Deck, which will be out on September 8th from Llewellyn. 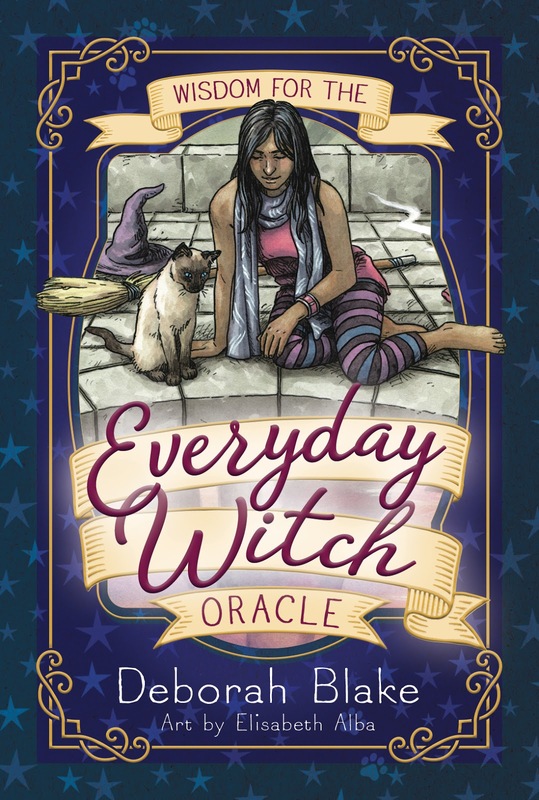 We had such a blast working on the Everyday Witch Tarot (which, incidentally, I just saw was on sale on Amazon for only $19.82 instead of its usual list price of $29.99) that we just had to find another project to work on together. If anything, this one was even more fun! And here is a picture of the back of the cards. 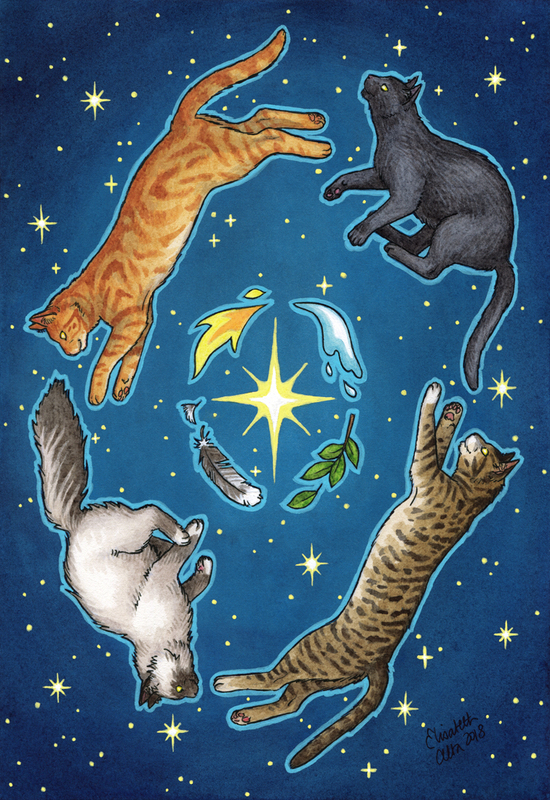 Four cats, each representing one of the four elements. Which one is your favorite? 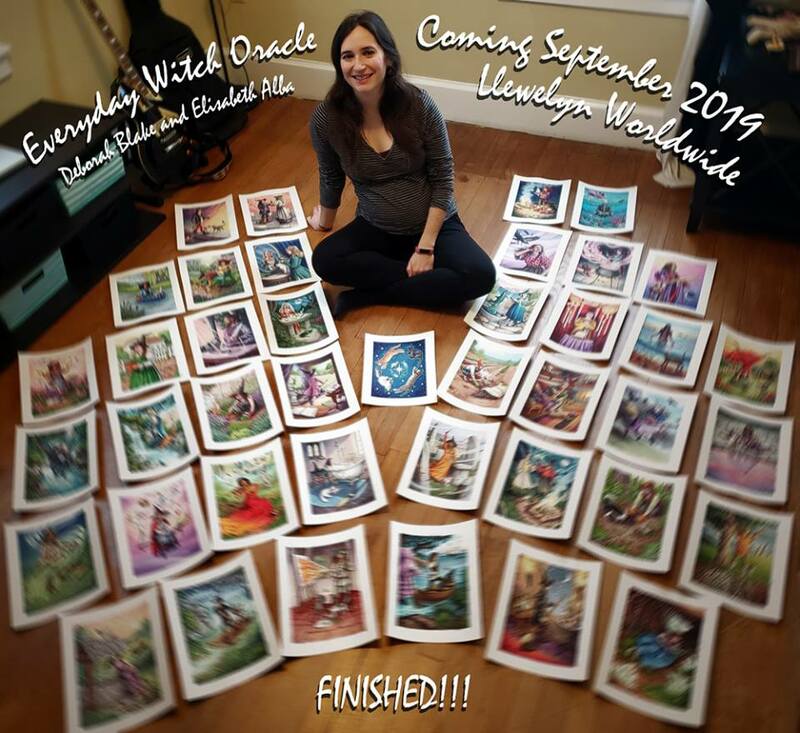 And as a bonus, a picture of Elisabeth with all forty finished original paintings! We are both so proud of this deck, and we can't wait for it to come out. We hope you'll all love it too. What do you think of the covers? It is the one year anniversary of losing my beloved Mystic, only eight days after losing his sister. 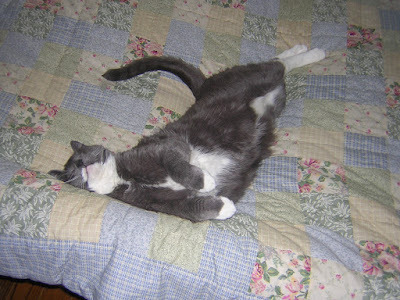 He was a gentle giant, my big Pooh Bear, and I still miss his weight at the end of the bed. But it is also the anniversary of the day I brought home Harry Dresden (the cat, not the wizard...we're not going to talk about THAT day). I had already found Harry--then named Ocean, which I thought was a sign, since I love the ocean--and was just waiting to bring him home until Magic and Mystic were gone. They needed and deserved all my attention there at the end. After I got home from the vet, it was just brutal walking into a house with only one cat in it, after having had five for so long. So I called up Harry's foster and said, "PLEASE can I come get him this afternoon?" and she was happy to let me do so. Blessings on all those who foster animals. Having him there (the other two weren't going to be able to join us for three weeks, while we were waiting for Ember to be spayed by the rescue I was getting them from) was all that got me through that first couple of really tough weeks, since Angus isn't much of a snuggler. So thanks for coming to live with me, Harry Dresden. I'm awfully happy you did. I looked terrible, because I'd been crying for days, but look how cute he was. The first time I went to see him, he crawled into my coat. I guess he wanted to go home with me! Which is why this calendar giveaway is going up today, instead of on the 1st of the month. Snort. This year I spotted something fun on one of my friend's pages on Facebook and couldn't resist ordering myself one. It is a calendar with hunky Australian firefighters with cute animals. Hey, it's for charity! (Don't judge me.) In fact, it was so cool, I got an extra one, figuring I could give it away. 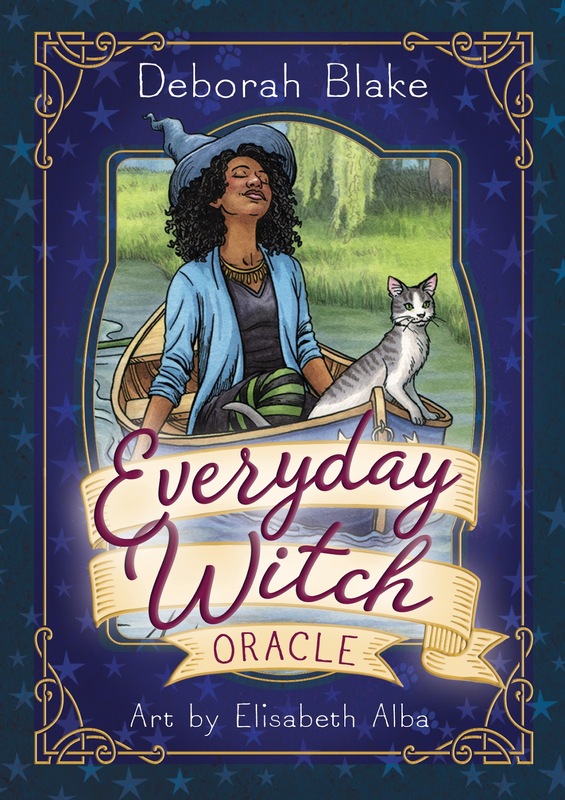 I also have one copy of the 2019 Llewellyn Magical Almanac (with my article on Magic and Cats). 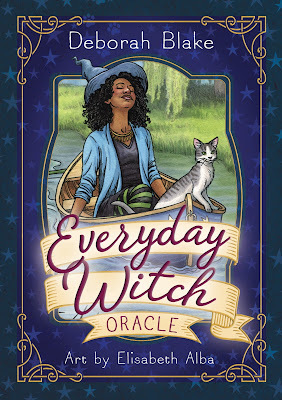 So, ta da, GIVEAWAY TIME! Besides getting new calendars, I'm also trying another cool thing I found on Facebook (YES, I spend too much time on Facebook). This is a simple way to focus on the positive in your life, which after last year I really needed. Plus simple, which is about all I can handle. Just take a jar and a bunch of pieces of paper, as colorful as you want to make them. Then every week, write down something good that happened, or something that made you happy, and put it in the jar. At the end of the year, pull out all the slips and read them, to remind yourself of how much good there is in your life. Pal Ellen and I started our jars on New Year's Day (the slip of paper already in there says, "Spent New Year's Day with Ellen--Chinese food, Doctor Who, and Scrabble") but everyone in Blue Moon Circle is going to do one. We're hoping to get together for a girl's night in sometime in January to decorate the jars. If not, we'll probably do it as part of our Imbolc ritual. One last things I'm doing to get the new year started off right is to do something a little different over at my Patreon. The folks who follow me there at the $25 level have as one of their rewards the chance to attend my monthly live online classes, or watch a recording of them later if they can't make it to the live one. 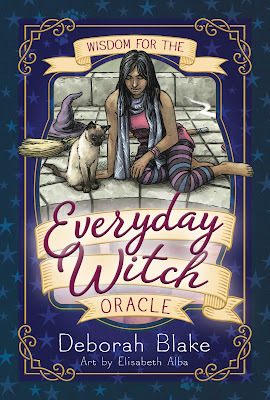 I usually do a witchcraft class and/or ritual, but sometimes I talk about writing, or just do an open chat. They're a lot of fun. So this month I'm going to throw it open to everyone, even if they aren't one of my patrons. I'm not sure yet if I'm going to do it on Monday the 21st for the full moon and lunar eclipse, or on Tuesday the 22nd for just a general chat. If you have a preference, say so in the comments! And be sure to check out my PATREON PAGE to find out when the open class is going to take place. I'd love to have you join me! Tell me, what are you doing to start your 2019 off right? No, the title of the post doesn't mean I didn't practice magic at all this year, although I did a lot less than usual, to be honest. Today marks the one year anniversary of the day I lost my beloved Magic the Cat, Queen of the Universe. 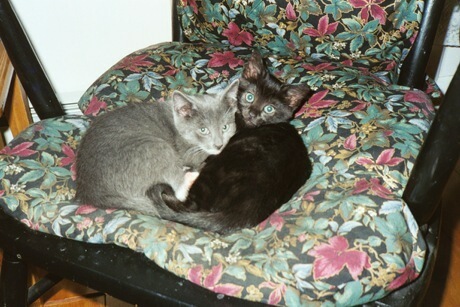 (And then her brother, the gentle giant Mystic, eight days later on the day after their 16th birthdays.) It has been a tough year in many ways, but probably the toughest was that she wasn't here to comfort me when things were bad. I have been fortunate to have many wonderful cats in my life, but the relationship I had with Magic was unlike any I've ever had before. I doubt I'll find it again, although one can always hope. They got bigger. Especially Mystic. She was my nearly constant companion--sleeping by my head at night (and nap time), and was the only true familiar I have ever had. She came to every ritual we did inside. 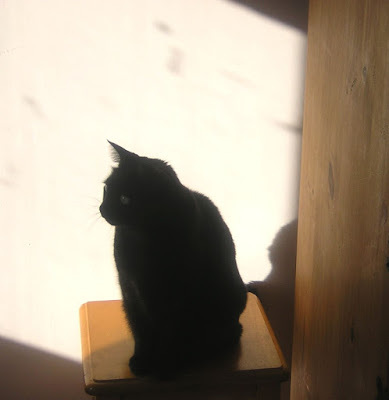 She looked like a completely black cat, but in the sun you could see she had darker stripes and a gray undercoat. She was so beautiful. She also supervised my writing, sitting next to me at the computer with her head on the edge of the keyboard (or right in front of the screen, as you can see here), and sitting either next to me or behind my head on the couch when I used the laptop. I haven't written as much or as well since I lost her. I got the kittens along with their mother Minerva, who I lost the year before, from a local shelter. I went in for one gray kitten, but Magic insisted on coming home with me (and the shelter folks begged me to take Minerva, who was terrified and sickly and completely unadoptable, but loved her kittens more than any mother cat I've ever known). She bossed me around then, and for almost another sixteen years. As a kitten, she used to leap from the floor to my shoulders (especially so she could supervise me in the kitchen) and continued to do so as an adult until the last few years of her life when arthritis made it impossible. She was as magical as her name, and I have missed her every day of the past year. The new cats, and 13 year old Angus, are great. But she left a void no other cat can fill. I expect to continue missing her (and her brother) in every day of the year to come, another year without Magic.